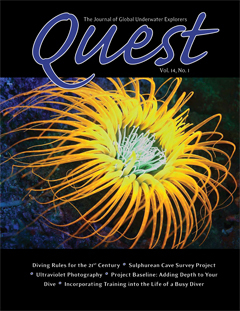 Quest is available online to all GUE Members, and in a beautiful, full-color printed magazine to GUE Silver level and higher members. If you would like to become a member of GUE and have access to Quest, please visit our Membership section. The electronic version of Quest is distributed in PDF format. You will need to make sure that you have Adobe Reader or a similar PDF reader installed before you will be able to read Quest in PDF format.